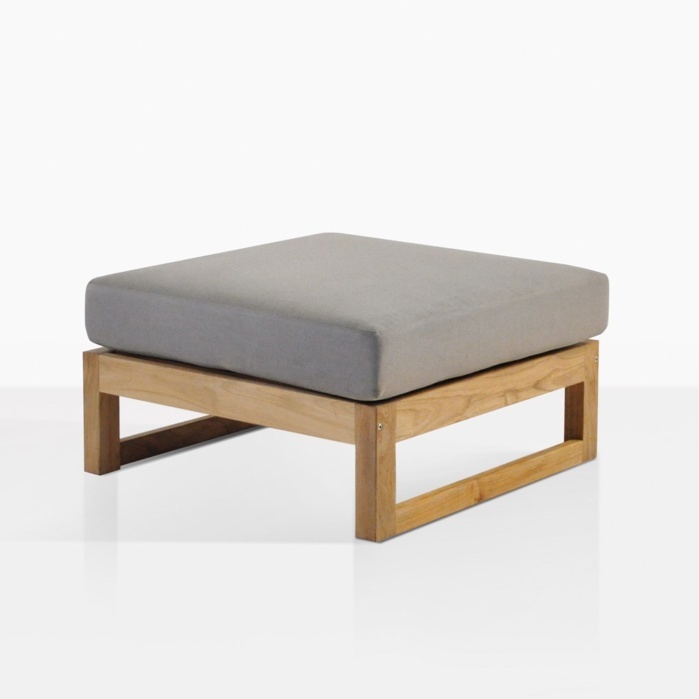 This teak outdoor ottoman is the perfect place to rest your feet with contemporary style and minimalist looks. Topped with a Sunbrella® cushion to match the height of the rest of the collection, the Pacific Teak Outdoor Ottoman is a perfect example of simplicity as style. 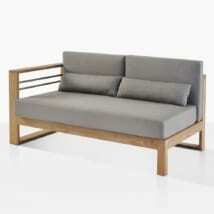 W31" x D31" x H16"
It takes a slightly less edgy approach to its design than the very industrial, muscular and contemporary Pacific teak outdoor furniture collection. 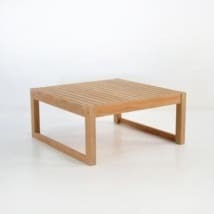 It’s within this slightly tamer version of the same square design idea that you’ll find simplicity and functionality combining to make the ultimate teak outdoor ottoman. 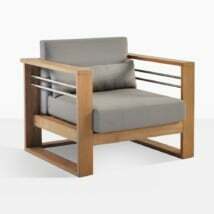 It helps turn the more business-like posture of the Pacific pieces into an easier to relax configuration. The Pacific outdoor lounge chair or the armless center sectional piece now become lounging pieces, where it’s expected that you put up your feet and get into the relaxation mode. 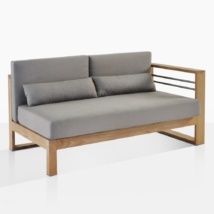 The square lines and balanced look of this modern piece allow it to go anywhere and serve as an accoutrement to just about any other furniture, A-Grade teak or otherwise. This outdoor ottoman is made of A-Grade teak, sourced to provide a consistent and timeless look whether you are determined to keep it looking warm and golden or whether you allow it to age and patina to a perfect silvery finish in the outdoors. The Pacific Outdoor Ottoman isn’t just a place to put your feet up in front of a chair; it feels equally at home in front of a sofa or sectional. The (just over) 30” wide squared, Pacific Teak Outdoor Ottoman gives enough impact to allow it to feel comfortable in front of large furniture pieces as well. 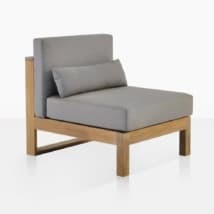 The adaptable design features square legs connected to thinner pieces to form a very fluid but angular design. It’s because of this flow that comes from this outdoor ottoman that it has the ability to integrate so smoothly with such a wide array of other furniture.